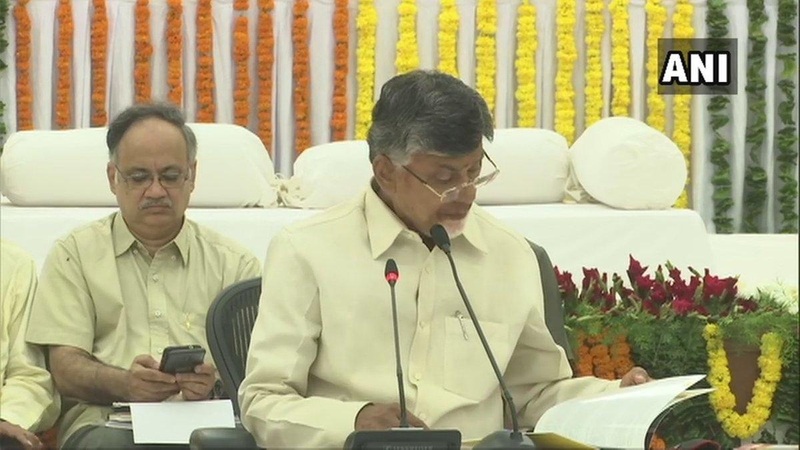 Amaravati (Andhra Pradesh) [India], Apr 6 (ANI): Telugu Desam Party (TDP) on Saturday released its manifesto for the Lok Sabha and state assembly elections, promising many benefits to the farmers, students and the unemployed. Releasing the party manifesto titled "Your Future My Responsibility" at his residence on the eve of Ugadi (Telugu new year), TDP president and incumbent Andhra Pradesh CM N Chandrababu Naidu said: "We have fulfilled all the promises made in our 2014 manifesto. "Only TDP can bring welfare and development in the lives of the poor. Our mission for 2019 is 150+ seats in the state assembly and all 25 seats of the Lok Sabha," he said. Targeting his primary opponent in the state Jaganmohan Reddy of the YSR Congress party, he said: "Jagan has traded Andhra's interests with those of neighbouring Telangana due to his bond with KCR (Telangana CM), he is yet to speak about interlinking of rivers and other topics important to Andhra. Only TDP can bring welfare and development in the lives of the poor." "Back in the day we waived Rs 24,500 crores loans of farmers but the centre and banks did not support that scheme then. The farmers are angry with Modi, and together we will teach a lesson to Modi and Shah. We will get a new prime minister soon," he said targeting Prime Minister Modi and BJP. Naidu announced the plan to interlink five rivers to boost agriculture with a special focus on horticulture, a Rs 5,000 crore prize stabilization fund will also be provided for the help of the farmers. Interest-free loans for the farmers and free 12-hour electricity supply for irrigation purpose is also promised in the manifesto. Naidu also announced the plan to give laptops to intermediate students and unemployment allowance to all intermediate pass students of the state. A promise to ensure every family earns at least Rs 2 lakhs per annum in the state was also made by Naidu. The manifesto promises increased honorarium to temple priests and also has provisions for paying an honorarium to imams and pastors.